Whether you’re running, swimming, cycling, participating in yoga classes, or even horseback riding, there can be no doubt that exercise is good for you. As an important part of a healthy lifestyle, exercise aids circulation and can lower blood pressure, strengthen your immune system, bones, joints, and muscles, as well as lessening the likelihood of suffering from certain conditions, such as strokes, diabetes, heart disease, and some cancers. Exercise is an essential part of daily life, and its positive impacts can be far-reaching. Indeed, every step, stretch, and movement that you make is one towards a healthier lifestyle. With all of this emphasis on the physical effects of exercise, it can be easy to overlook its other advantages. For example, did you know that exercise could benefit your mental health and wellbeing too? In fact, exercise is one of the most effective ways of improving mental health, lifting your mood with a release of chemicals known as endorphins. Those chemicals, often referred to as ‘happy hormones,’ interact with your brain’s receptors to reduce your perception of pain and ill-feeling; a little like pain medication or anti-depressants, endorphins give your brain the boost it needs to function happily and healthily. Exercise can be a great mood-booster, lifting your confidence and helping you to cope with daily anxieties or stressors. As we career towards shorter days and longer, darker evenings, exercise can fight the winter blues in a way that comfort eating and drinking cannot. What could be better than heading out for a brisk walk, or run, when it’s time to fight winter restlessness? If you’re considering getting out there and trying something new we commend you. The first step towards a healthier, happier lifestyle is realizing that there are changes to be made – and seizing those opportunities as they present themselves. Is there something you’ve always wanted to try, but have never been brave enough? Believe it or not, the winter months are a great time to get started, ensuring you will be fighting fit by the time the spring and summer roll around. Did we mention that exercise is a great way to combat those winter blues, too? Indoor activities such as yoga, Pilates, swimming, and spinning are perfect at this time of year, while walking, jogging, and cycling will keep you warm when you head outdoors. 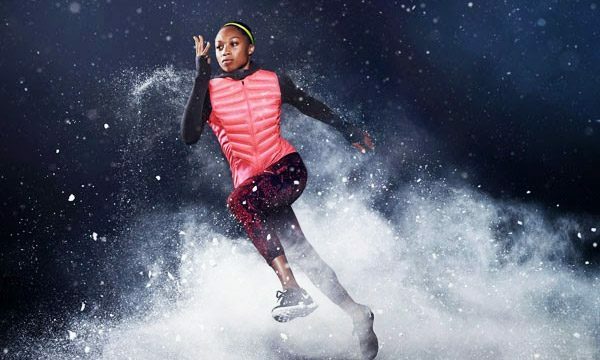 In fact, there’s no need to forgo your regular exercise regime, so long as you’re wrapping up warm and preparing yourself for the varying weather conditions. So, what are you likely to need? Layers are crucial, so be sure to wrap up warm before you head out to exercise. Compression wear is an especially good idea if you’re going to be taking up a new activity; its material and core will improve your circulation, support your joints and muscles, and keep you warm – whatever you’re doing. Quality footwear, a water bottle, and a flashlight for nighttime jaunts are also of importance. It’s vital to keep yourself as comfortable as possible; we are more inclined to exercise if we feel warm and supported, so choose garments that complement your curves. Finally, consider the gadgets that are going to help your healthier endeavors, including a heart rate monitor, fitness tracker, or exercise app. Far from weighing you down, these kinds of gizmos can be great motivators, and help you to keep track of your achievements each day, week, and month. Looking back on your progress can be truly heartening. There has never been a better time to dust yourself off and get out there, particularly if your sole mission is to get fit and healthy and give those endorphins a boost. The days might be shorter, darker, and noticeably chillier, but that’s no reason to stay indoors. Do you often have difficulty finding the energy to get going? Continued exercise is a great way to increase your energy levels, while better sleep, staying hydrated, and even listening to music can all give you the lift you might need at this time of year. Create a playlist of tracks that you love to sing and dance along to, and set out with the aim of starting gently; don’t ever try to push yourself too hard, or you’ll find exercise and working out a real chore. You might also want to consider attending sporting activities and classes with a like-minded friend or family member. Companionship usually provides an incentive to keep attending exercise sessions and will give you the energy you need to power through those increasingly complex moves. Laughter is a great motivator! Exercise is essential for a healthy, happy life. Spending more time outdoors and regular exercise is vital if we’re to stay in peak physical condition. Getting fit and remaining active is about so much more than that, though; it’s about fighting the winter blues, battling anxiety, depression, and stress, facing every day with confidence, and learning to lead a happy, healthy life. Okay, so the winter might be well and truly upon us, but that’s certainly no excuse to forgo your daily dose of endorphins. Go on, enjoy a little exercise on us!